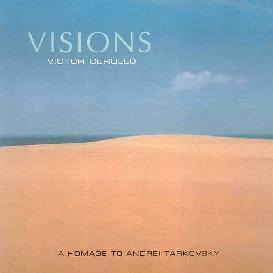 Victor Cerullo - "Visions: A Homage To Andrei Tarkovsky"
Victor Cerullo is an Italian musician whose influences range from ambient, to progressive rock, to synth-pop. The music on this homage to Andrei Tarkovsky is characterized by gradually evolving floating ambient works with a powerful spacey vibe. Cerullo sets the tone for the set early as we're treated to drifting glassy toned waves of sound and lightly splashing water that are soon joined by spoken word, a choir, and eventually shooting space alien sounds... much welcome freakiness that crops up from time to time throughout the album. Tonal development is key to Cerullo's work, a trademark being a principle sound weaving its way snakelike along an arid aural landscape. The music is both haunting and meditative, minimalist and majestic. Cerullo doesn't glom together multiple layers of sound. Rather, he takes a few choice elements and allows each to evolve in its own individual direction while managing to find themselves intricately intertwined with one another. Cerullo also likes to incorporate chanting and choirs into his work, lending a heavenly spiritual quality to the music. But Cerullo can also create powerfully emotional songs, the best example being "Andrei Tarkovsky", a piece that takes a beautiful melody and embellishes it with light space electronics. And one of my favorite tracks is the strange and hauntingly atmospheric "Lullaby For A Distant Son". And enjoyable set that will please ambient fans. For more information you can visit the Electroshock Records web site at: http://www.electroshock.ru. Electroshock music is distributed by Eurock. You can visit their web site at: http://www.eurock.com, or email them at: apatter@eurock.com. Contact Eurock via snail mail c/o Archie Patterson, PO Box 13718, Portland, OR 97213.